If you are a member of the U.S. Military, you have undoubtedly heard of USAA Insurance. USAA (United Services Automobile Association) is an insurance company serving members of the U.S. Military with insurance banking, investment, retirement planning and financial counseling services. For service men and women and their families, the company offers many attractive benefits to its members. USAA began in the 1920s. It was founded by a group of twenty-five army officers who were looking for insurance. Most companies would not insure members of the military because they were considered a high-risk group. The company expanded its services to include not only insurance products, but also banking and investment services. From its early beginnings, USAA has grown to over 8 million members and is worth of $19 billion. The company is headquartered in San Antonio, Texas. USAA has consistently received the highest rankings from insurance rating companies such as A.M. Best, Moody's and Standard & Poor's. It has also won numerous customer service and other awards from organizations such as Forrester Research, Inc., Fortune 500, Javelin Strategy & Research, InformationWeek 500, Council of Better Business Bureaus and Insure.com among others. Because USAA targets its services only to members of the military, it concentrates on offering the best service and products to only service members and their families. All members of the U.S. Military are eligible for USAA membership along with National Guard and Reserve members and children of USAA members. Service members may determine their eligibility from the company website. Former members can resume their membership at anytime. There is no age limit. Anyone who has ever served honorably in the U.S. Armed Forces is eligible for USAA membership. USAA has received the highest rating available from A.M. Best of “A++” Superior. Moody's and Standard & Poor's also give USAA their highest financial strength ratings. The company has also been ranked in the top 200 companies by Fortune 500. J.D. Power and Associates gave two awards to USAA in 2011, Customer Service Champion and the top Self-Director Investor Study. Members of the military can trust in the financial stability of USAA. From the company website, members can access information about all the insurance products available, banking products and services, investing, real estate, retirement planning and health insurance information. There are also discounts available for home solutions, travel deals, online shopping, and car buying services. The advice center offers military members retirement advice, estate planning, financial resources, family living advice, disaster and recovery information, information on military life, car buying help, advice on buying/selling a home and more. For a full-list of products and services, you can visit the USAA website or call 1-800-531-USAA (8722). Members of the military have many options to choose from when it comes to insurance and financial services. 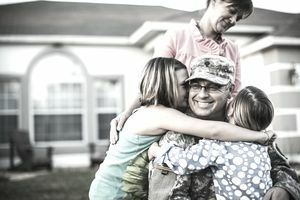 If you are serving in the military, you do not have to buy your insurance from USAA; however, there are many reasons why USAA is a good choice. USAA offers a one-stop shopping experience for service members to take care of all their financial needs. It is a financially sound and customer service oriented organization. When shopping for affordable insurance, members of the military will find the insurance rates highly competitive. Also learn about Armed Forces Insurance Company.